Back cover blurb: Ben wakes up in a hospital with a hole in his head he can't explain. What he can remember he’d rather forget. Like how he’d spend nights as a limo driver for the wealthy and debauched….how he and his wife, Maggie, drifted apart in the wake of an unspeakable tragedy…how his little brother, Cola, got in over his head with loan sharks circling. Maggie is alone. Again. With bills to pay and Ben in a psych ward, she must return to work. But who would hire her in the state she’s in? And just as Maggie turns to her brother, Francis, the Internet explodes with video of his latest escapade. The headline? Drunk Priest Propositions Cops. Francis is an unlikely priest with a drinking problem and little interest in celibacy. A third DUI, a looming court date.…When Maggie takes him in, he knows he may be down to his last chance. And his best shot at healing might lie in helping Maggie and Ben reconnect—against all odds. 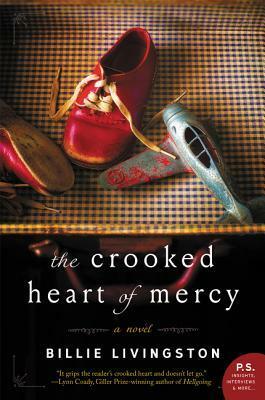 Simmering with dark humor and piercing insights, The Crooked Heart of Mercy is a startling reminder that redemption can be found in the most unlikely of places. The Crooked Heart of Mercy is a heart-warming novel about love, loss, grief and friendship that can be found in the most unlikely of places. When Ben wakes up in a psychiatric ward he refuses to engage with his psychiatrist. In his own mind, he isn't Ben, at least not the Ben he used to be. The Ben that loved Maggie and their son. The Ben who chauffered druken celebrties and high flying execs around town to make ends meet. But Maggie isn't Maggie anymore either. She is struggling to make ends meet, but reluctant to take up work, as she is grieving for both the loss of her son and her husband. Maggie is meeting with an elderly lady when she takes a call regarding her brother Francis. Francis, is a priest, who needs Maggie's help. He has just been done by the cops for Driving Under the Influence, for a third time. The church want him to go to rehab, but as his court date looms nearer, Francis seems content to meddle in Maggie's life and dabble in a little 'romance' on the side. As separate as they may now seem, these people love each other, and will ultimately lead each other back together. The Crooked Heart of Mercy is beautifully written, with a wonderful ending and I look forward to reading more from this author. The Crooked Heart of Mercy is available to buy now via Amazon online and all good book shops. Thank You to Marta Juncosa at Harper 360 who provided me with a copy of this novel in exchange for an honest review.